So this isn’t exactly a “yarny” blog post but I had to document this project somewhere. For Hallowe’en this year, I decided to go as Dorothy from the Wizard of Oz. A friend of mine had the costume that I could borrow, and this gave us both good earth karma (yea for reusing!) But one really can’t be Dorothy without the ruby slippers. I asked my friend how she did her shoes last year and she told me that she spraypainted a pair of heels red. Hmmm. I didn’t want to wear heels (I do have a stellar pair of 6″ lipstick red lovelies) as I knew that I would only last an hour or two in them. So I brainstormed. I had a pair of Keds-type runners from a previous year’s costume when I went as a cheerleader. The shoes were really dirty from running around in the rain on that Hallowe’en. I was hanging onto them in case I did the cheerleader thing again. 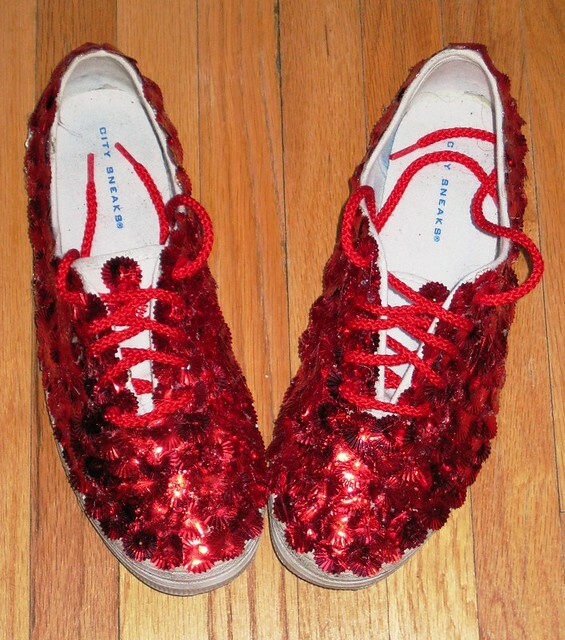 And then I thought, what if I could turn those old shoes into ruby slippers? I went with option #3. While time consuming, I feel as though the end result was worth it as the shoes really did look awesome. It took me about an hour per shoe, and chatting with friends on the phone helped pass the time. Method: started at the toe of the shoe and overlapped the sequins, did sequential building rows and covered the lace holes to give a more uniform, overall shiny look. And for anyone curious to see the whole costume, voilà! You are currently reading Somewhere, over the rainbow… at When Gaia Smiles.